Summayl was a Palestinian Arab village in the District of Gaza, located 36 kilometers (22 mi) northeast of Gaza. It was situated on a sandy hill in the coastal plain and had a population of 950 in 1945. It was depopulated during the 1948 Arab-Israeli War. Summayl was founded in 1168 during the Crusades by the Hospitallers for the purpose of protecting the fortress in Bayt Jibrin. Local tradition claims it was named after Samuel, one of the Crusaders who established the village. Under Mamluk rule in the 13th-15th centuries, it was referred to as Barakat al-Khalil ("the blessing of Abraham or Hebron"), because its tax revenues were used by the sultan Barquq to endow the Ibrahimi mosque in Hebron. In 1596, Summayl was within the boundaries of the district of Gaza. With a population of 363, it paid taxes on wheat, barley, fruit, beehives, and goats. When Edward Robinson visited Summayl in the mid -19th century, he noted that it was a "considerable village on an elevation of the plain." He noticed a public well over 100 feet (30 m) deep and 11 feet (3.4 m) in diameter. He said that there was "portion of an ancient wall apparently once belonging to a castle." In the late-19th century, Summayl had a semi -circular plan. During the British Mandate period, the village expanded toward the southwest and relied on al-Faluja for commercial, medical, and administrative services. A mosque built on the remnants of a Crusader church was maintained by the Muslim inhabitants. Village houses were built of Summil and a school opened in 1936. By the mid-1940s it had an enrollment of 88 students. The community obtained domestic water from a 48 meters (157 ft) deep well named "al-Khalil". Summayl was captured by the Givati Brigade's thrust southward during the period in the 1948 Arab-Israeli War known as the Ten Days between the truces of July 8 and July 18, 1948. During this offensive, Israeli forces managed to occupy a broad swath of territory south of the Jerusalem-Ramla road, displacing over 20,000 people. Although Israeli military accounts later claimed that the inhabitants fled with the approach of Israeli columns, the Haganah spoke of "several cleaning operations" with Summayl being one of the villages mentioned. Its inhabitants fled east toward the Hebron area. On July 19, 1948, an IDF patrol clashed with armed infiltrators at Summayl, killing one and wounding another. The patrol warned any refugees they encountered that if anyone of them entered "the areas under our control-they would be killed". The day after, on the July 20, the IDF were formally instructed to prevent infiltration to Summayl, Barqusya, Bi´lin, Masmiya al Saghira, al-Tina, Kheima, Idnibba, Jilya, Qazaza, and Mughallis. The orders specifically were to "destroy" any "armed force" encountered, and to "expel...unarmed villagers". The Palestinian historian Walid Khalidi described the village remains in 1992 as: "The remnants of a wall, perhaps one that was built around the village, are still visible. 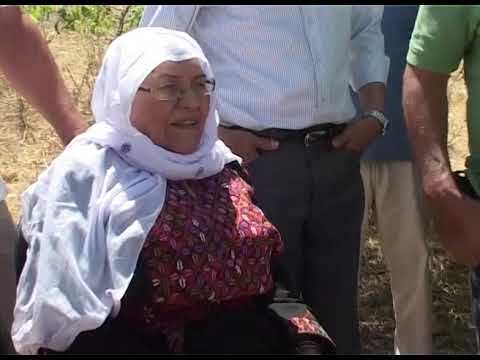 Otherwise, much of the site is overgrown with khubbayza (a wild plant belonging to the mallow family that is cooked as a vegetable in Palestinian peasant cuisine) and grass. There is also a Christ's-thorn trees and dense stands of cactuses; an old cactus-lined village road is visible. The adjacent land is cultivated by Israeli farmers.